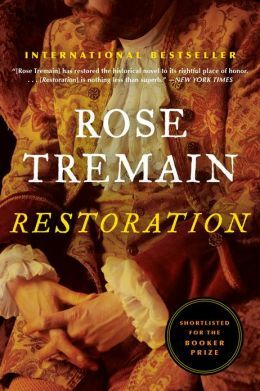 I really enjoyed Rose Tremain’s Restoration, which an excellent friend promptly posted to me when I needed a bit of cheering up. (Everyone should have a friend like that!) Not that Restoration is very cheerful, but a good novel is always a tonic, isn’t it? And Restoration is awfully good. Like Wolf Hall, it’s a historical novel that is less about history than about character — which is not to say that these aren’t books steeped in research and full of marvelously tactile historical details, but that the detail never seems decorative (or pedantic) because it is so integral to the lives into which we enter. In both novels, also, those lives are not just individual characters but embody the character of their age. ‘No. I feel nothing at all.’ . . .
Ergo, the organ we call the human heart and which is defined, in our human consciousness, as the seat – or even deified as the throne – of all powerful emotion, from unbearable sorrow to ecstatic love, is in itself utterly without feeling. A selfish lout — a buffoon, even — for most of the early action of the novel, Merivel is brought low only to be restored — not to riches but to human dignity. His account of his own life hides none of these unattractive characteristics: aptly for the period, it’s a ‘warts and all‘ portrait. Tremain neatly incorporates this theme into the novel itself through the painter Finn, who begins by training Merivel in artistic idealization and ends a successful painter of “merchants, barristers, schoolmasters, drapers, cabinet-makers, clerks.” Finn’s new method is actually Merivel’s idea: “do not paint me as a rich man, dressed up in satin or with a sea battle going on behind my head; paint me as I am, in my old wig and in my shirtsleeves and in this simple room.” This idea, which “had only that second entered [his] mind,” is a sign of how far Merivel has come from his earlier ostentatious luxury and preening self-indulgence. I stare at Sir Joshua’s face, looking down towards his viola, and, layer by layer, in my anatomist’s sadness, I peel back skin and muscle and nerve and tendons, until I can see only the white bone of his skull, the empty sockets of the eyes . . .
All my anatomical studies seem to have brought me to a great sadness. When a man plays a viola da gamba, I want to share in his joy, not see his skull. For where will such visions end? . . . Such a perpetual and visible awareness of mortality would, I am certain, bring me to despair in a very short time. . . . I must avoid, then, coming to despair and madness. I must try to forget anatomy. Forget it utterly. I had grown most peculiarly thin. The waist of the breeches was too large for me by more than two inches, so that the wretched things would not stay up, and, when I put the coat on my back, it hung out from my body like a cape. . . .
For the whole of my life I had never been thin. . . . Now, all the flesh was falling away and every bone in me being slowly unsheathed and made visible. “I began,” he concludes, “to consider the possibility that I was dying.” This moment seems to me to bring us back to his horror at the viola player’s skull: in acknowledging his own mortality, Merivel is finally ready to begin living a life in which his body and his spirit work together. And so he returns to the home he once prized (and over-decorated) so greedily and is given a chance to start again.